I completed my first ever birthday card commission! yay. 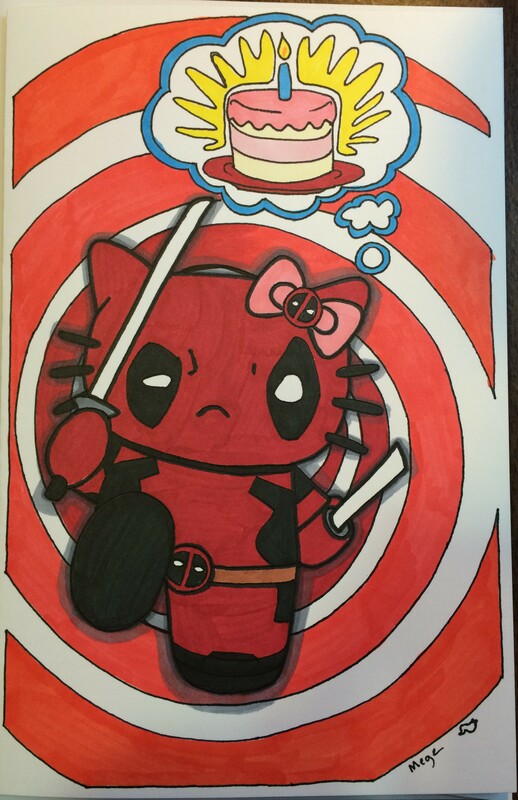 The card features Hello Deadpool, a combination of Hello Kitty and the Marvel character, Deadpool. I gather that most people are familiar with Hello Kitty in some form or another, but less may know who Deadpool is. He showed up on film in Wolverine: Origins played by Ryan Reynolds. Supposedly, he will be making a stand alone Deadpool film, but after his flop with Green Lantern, I think that ship has sailed. Deadpool fights with Japanese style swords, is physically invulnerable, and can break the fourth wall in the comic books. He is often talking to the reader, and many people think that a movie of the character should talk to the viewing audience. Only time will tell. Hello Deadpool only has one thing on her mind, however, and that is birthday cake! I keel you for cakes! My sons would love this card. They love anything from Marvel or DC comics and Deadpool is one of their favourites. The humour of the Hello Kitty makeover would appeal to them too. Great work.